Why Include Fresh Pressed Vegetable Juices? Having a staple collection of juice recipes to choose from will help you simplify and maintain healthy lifestyle choices. I love having a set of juice recipes that will cover my nutritional basic needs. With this in mind, I wanted to create a juice recipe that would include beneficial red, orange, and yellow vegetables with a touch of green. 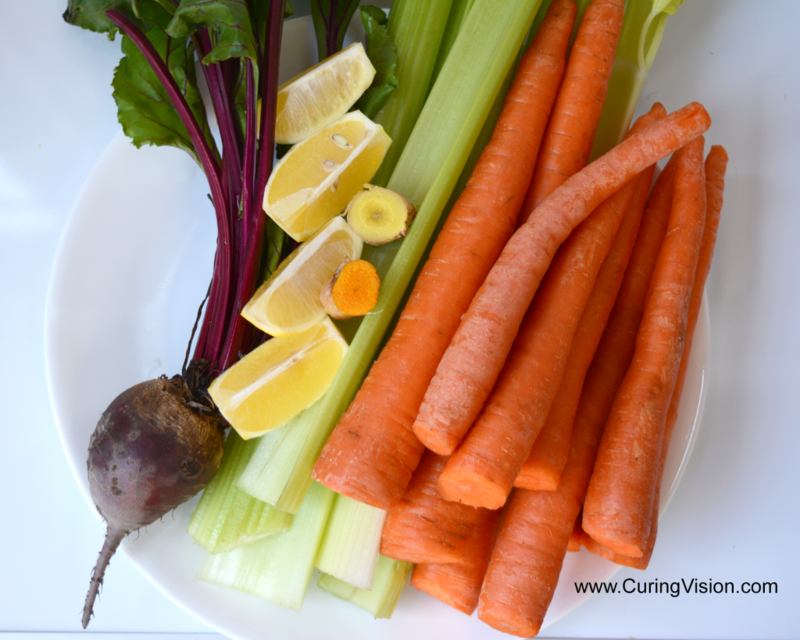 I chose red beets, carrots, celery, turmeric root, ginger root, and lemon. To make my juices, I use the Omega J8006 juicer. This is a masticating juicer, which replicates the chewing action of eating the produce yourself. It is slower than a centrifugal juicer, but it will juice greens beautifully, unlike the centrifugal, so I do not mind the extra few minutes it takes to make my fresh pressed juice. But we need fiber, juicing is bad! This is a statement that I hear often, and I half agree with this. We do need fiber in our diet, this is the food that our gut bugs need to keep us healthy and happy. I also believe that juicing is wonderful because it is a way to easily consume large quantities of fresh produce that would normally be impossible to eat whole. Never would you sit down to a plate full of vegetables like this and eat every bit of it. 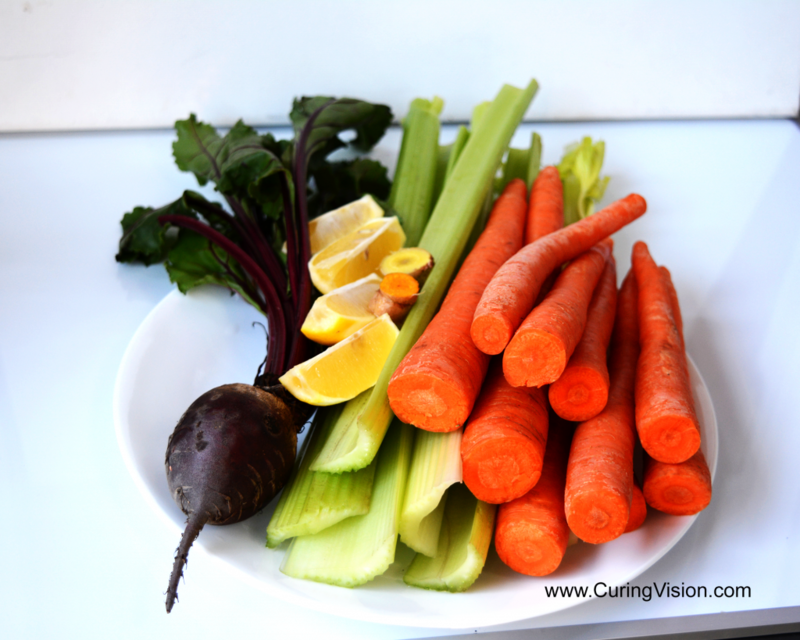 There is so much fiber you would feel full after two carrot sticks and half the beet. Put this same produce through a juicer first and it’s not a problem! Consuming large quantities of produce by juice extraction is especially important for management of disease symptoms; think of how many times you have heard certain diseases are improved after eating more vegetables. This is why we juice, to restore the nutrient deficiencies that are related to disease symptoms. Below I explain the benefits of each ingredient in this juice and give examples of how they can benefit your quality of health. To make sure you are eating enough fiber, round each day off with a large salad at dinnertime! Red beets are probably best known as a childhood dinner-time torture device. Thank your mom for doing that, she was feeding you a nutritionally dense food that is perfect for building blood cells to promote easier blood flow and better cardio performance. If she bribed you to eat them with the promise of having more energy to play, she was correct! Red beets are an excellent food to include for increased energy because they contain iron, B vitamins, magnesium, and other essential nutrients. Red beets have been studied as a dietary supplement for supporting the regulation of antioxidant defense mechanisms. In this study published by the journal Nutrients, beetroot powder supplementation was found to hold “promise as an economic, practical and importantly natural dietary intervention in clinical settings.” “Its constituents, most notably the betalain pigments, display potent antioxidant, anti-inflammatory and chemo-preventive activity.”  This research has sparked interest in studying red beetroot and it’s potential benefits for liver disease, cancer, and arthritis. If you don’t own a juicer yet, red beetroot juice powder can be easily added to your favorite smoothie recipe. When I talk with other people about drinking red beetroot juice, they always ask, “Doesn’t it taste like dirt?” And my answer is, “Yes, fresh red beet juice tastes like sweetened dirt to me, until I began adding lemon to the juice.” More recently I have also began adding a lime. The blend of lemon and lime takes the flavors of the juice to another level. On a personal note, all I can think about is drinking more fresh juice with lemon and lime since I have started adding them together. Celery is surprisingly a natural source of sodium, potassium, phosphorus, and vitamin K. Each of these nutrients are used to support kidney function and bone formation. Some say its divine appearance hints to it’s bone health support; celery sticks are very strong, somewhat flexible, and uniquely similar in appearance to human bone. Turmeric, ginger, and lemon are what I personally consider to be the trifecta of nutritional foods. I include these three as much as possible in all fresh juice recipes due to their supportive benefits of the digestive system, inflammatory response, and lymphatic system. I think of them as little cleaners of the body. Turmeric has been studied countless times, historically by the Indian culture and scientifically by modern researchers. It is shown to be excellent for inflammation management, in particular for pain associated with arthritis. To improve the potential healing properties of turmeric, it is said it’s best activated when combined with black peppercorn. “Piperine is the major active component of black pepper and, when combined in a complex with curcumin, has been shown to increase bioavailability by 2000%.”  Toss a lime into the mix if you like an extra tart flavor! 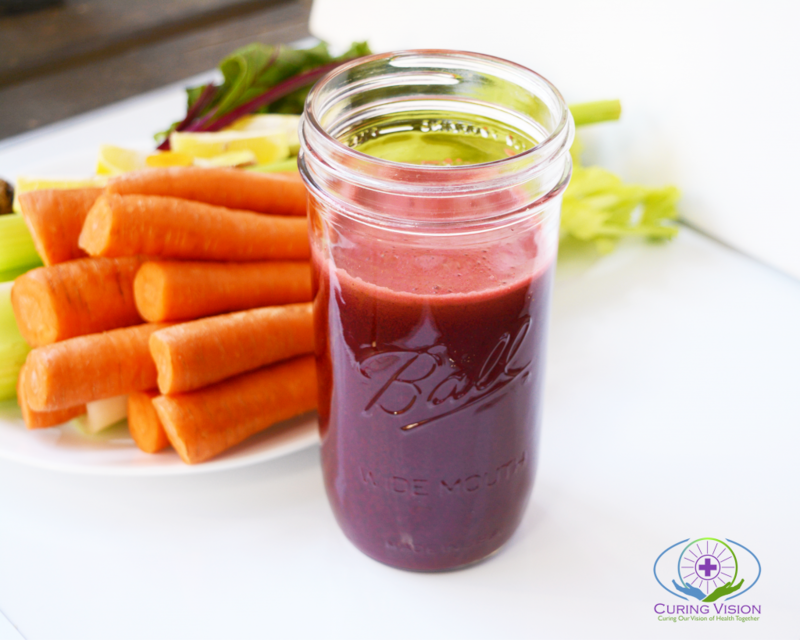 This juice recipe can help meet dietary nutritional needs. Wash and cut produce to fit into juicer feeding chute. Drink immediately, or store in a glass jar in the refrigerator for up to 24 hours. Will You Make This Juice Recipe? Making fresh juices is what I consider an essential core importance in using foods to support optimum health. 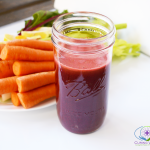 I have been preparing fresh juice from the beginning of my health journey beginning in 2012, and over the years have tried many different combinations but still find myself making this as one of the foundational juice recipes. Any time that I need a gentle energy pick-me-up, I know that can be resolved with this juice recipe. I hope you will give it a try and let me know what you think in the comments below! This post contains affiliate links. 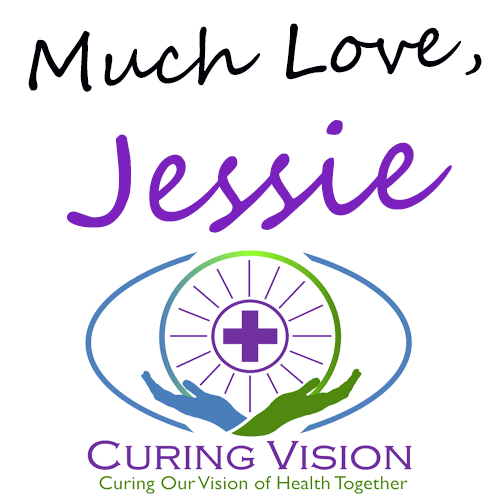 Thank you for supporting the mission of Curing Vision to bring more information about the true vision of health! This information is for educational purposes and not to treat or diagnose any medical condition. Please read my full disclaimer at this link. Yilmaz B, Sahin K, Bilen H, et al. Carotenoids and non-alcoholic fatty liver disease. Hepatobiliary Surg Nutr. 2015;4(3):161-71. 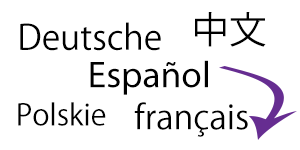 Li WW, Li VW, Hutnik M, Chiou AS. Tumor angiogenesis as a target for dietary cancer prevention. J Oncol. 2011;2012:879623.